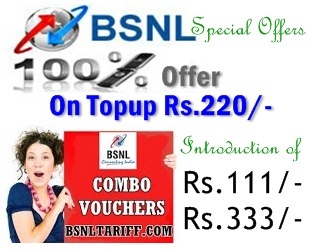 On Account of upcoming festivals Public-Sector-Unit Bharat Sanchar Nigam Limited (BSNL) has announced Full Usage Value offer on Topup denominations and introduction of Combo Topup Vouchers under both 2G- 3G Prepaid Mobile Services for limited period as promotional basis. The Competent Authority of Karnataka Telecom Circle has introduced promotional offer, Full Usage Value which is equal to MRP on Topup Denominations costing Rs.220/- for a period of 15 days from 01-09-2013 to 15-09-2013 as promotional basis for Karnataka Circle Customers. Combo Topup Voucher of Rs.111/- (Including Service Tax) offer, Free Usage Value of Rs.90/- with Free 70 minutes for On-net calls to be used within 20 days. Combo Topup Voucher of Rs.333/- (Including Service Tax) offer, Free Usage Value of Rs.280/- with Free 180 minutes for On-net calls to be used within 60 days. Note: The Combo Topup Denominations may be activated only through C-Topup (Easy Recharge) .